An adorable design by artist Debbie Mumm. Features an Orange Bird on a Limb. Design size: 5.5" x 5.5" (14cm x 14cm). 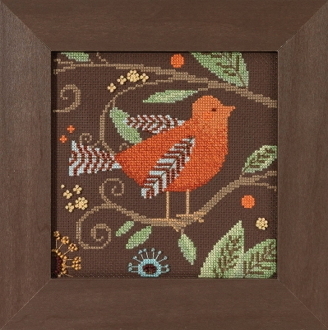 Mill Hill Glass Beads, 16 count Aida fabric, floss, needles and chart with instructions. Frame sold separately, see item 40-529, GBFRM4 Chocolate Frame.